Frank and Joe must take the shine off a jewel thief who sends ominous riddles in this Hardy Boys adventure. First a priceless painting disappears from the museum; then two ancient samurai swords vanish from a private collection. A string of robberies has hit Bayport, and all signs point to “the Phantom,” a recently released ex-con who last struck more than twenty years ago. There’s only one problem: the Phantom has vanished into thin air, and not even Frank and Joe Hardy can track him down. Then the boys begin receiving threatening notes in the mail, each one containing a strange riddle. 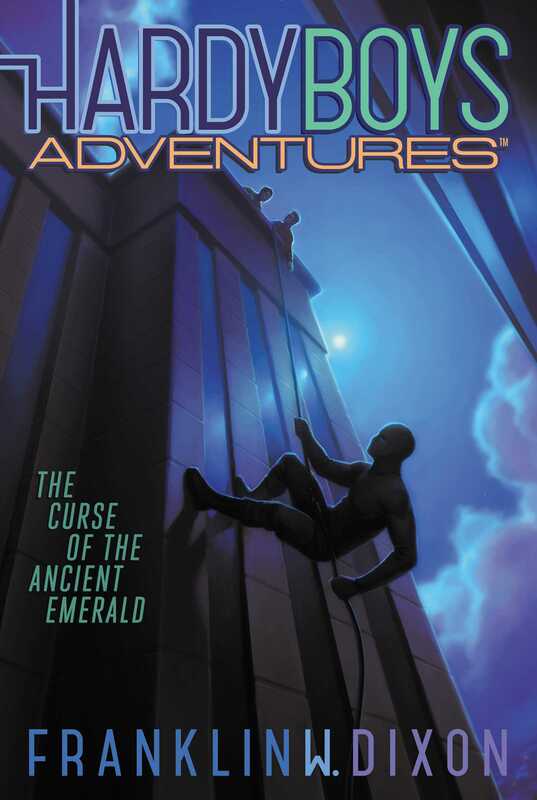 And it looks like the Phantom’s next target could be the valuable Emerald of Astara, the 2,500-year-old crown jewel of the Bayport Historical Museum. Can the Hardys crack the Phantom’s code before he strikes again? I fought down a groan as he waited expectantly for the class to acknowledge his amazing sense of humor. This guy was terrible. “Don’t give up the day job,” called someone from the back of the group. Our school chaperone, Mr. Sweeney, swiveled around and fixed Neal “Neanderthal” Bunyan with his laser glare. “Busted,” muttered my brother, Joe. Neanderthal’s grin faded under Mr. Sweeney’s withering look. I whistled appreciatively and leaned in to inspect the egg-size jewel. Hidden lights inside the glass case made the green stone twinkle and glint. It looked like something Indiana Jones would fight to get his hands on. Joe had been looking pretty bored since the class arrived at the Bayport History Museum for our school trip. But talk of an ancient curse was enough to get him interested. “How did he die?” I asked. “People don’t die from curses.” I snorted. Amber smiled back at Joe, and I fought down a little twinge of jealousy. Amber was new in our class and had taken to hanging out with us in the cafeteria and at our favorite coffee shop, the Meet Locker. She was smart, funny, and incredibly good-looking—the complete package. I’m not usually the type to run off chasing girls—that’s Joe’s thing—but there was something different about Amber. “Six is a lot!” protested Chet. “Didn’t Sir Arthur Conan Doyle believe in the curse?” asked Amber. “It’s so cool that you know all that,” said Amber. I heard the rest of the class snickering. Amber shook her head in a mock sorrowful motion and wagged her finger at us. “I bet Catwoman could steal it,” said Joe. The tour guide smiled. “I think even Selina Kyle would have trouble getting her hands on this prize,” he said. I raised my eyebrows. I was surprised he even knew who Catwoman was. I fell into step beside Joe. “She’s really something, isn’t she?” asked Joe, nodding his head toward Amber, who was a few paces ahead of us. “You’re always starving,” said Joe. The tour guide stopped before a door with a sign saying STAFF ONLY. KEEP OUT. He unlocked the door and led us into a narrow corridor. I peered into rooms as we passed them, curious about what was kept back here, but it wasn’t very interesting—offices and storerooms, mostly. The guide finally stopped before a heavy wooden door. Mr. Sweeney glared at us to reinforce the words, and the guide opened the door. The room beyond was huge, illuminated by long strips of lights that hung from steel ceiling beams. There were no windows anywhere, which I assumed was a security thing. Off to our left was a long workbench where somebody was painstakingly cleaning an old pottery vase using something that smelled of strong chemicals. “Welcome to the exciting world of art restoration,” announced the guide proudly. “Riveting, don’t you agree?” whispered Amber to my left. Amber snorted with laughter, then blushed bright red and slapped a hand over her mouth. I grinned at her, then realized we had been left behind. The rest of the tour had moved deeper into the room, stopping before a painting mounted on an easel. A man who looked to be in his fifties was leaning close to the piece, a tiny brush in his hand. The painting depicted a ruined boat sinking off a rocky coast. The sky was filled with storm clouds, but just to the right the sun was breaking through, pillars of bright light striking the waves. The upper-right portion of the painting, where the sun was visible, was vibrant—obviously where the painting had been restored. But the rest of the picture was dull and muted. Mr. Ramone turned to stare at us. He was wearing these weird glasses with majorly thick lenses in them, giving him the look of a surprised owl. “Nice job if you can get it,” said Neanderthal. “That’s three strikes for Neal, then,” Joe murmured into my ear. I was about to reply when the room was suddenly plunged into darkness. He was cut off by a startled cry of pain. I heard a clattering sound, a grunt, and a scuffle, then something breaking. “It’s not me, sir!” Neal shouted. “Everyone stand still,” I called out, fishing around in my pocket for my phone. It looked like the rest of the group had the same idea, because a second later the room was filled with the white glow of our screens. I pointed mine in the direction the noise had come from. Mr. Ramone, the restorer, was lying unconscious on the floor, a trickle of blood clearly visible on his bald head. He shifted his phone so that he could dial 911. As he did, I noticed something else: The painting that had been resting on the easel was gone! I whirled around, searching the room. Amber must have seen the same thing, because she took a step away from the rest of the class, peering into the darkness. I looked to where she was pointing and saw a black-clad figure running toward the door. He had a ski mask pulled over his face and wore what looked like night-vision goggles—the kind that army rangers use on evening patrols. He held the painting beneath his arm as he dodged around the workbench and vanished through the door. “Stop, thief!” I shouted, and sprinted after him.